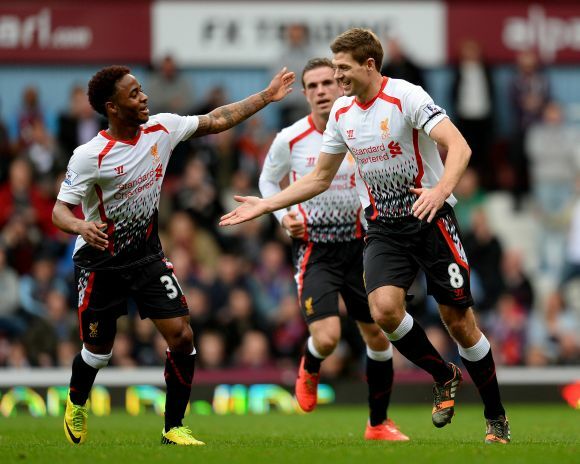 Steven Gerrard scored two penalties as Liverpool went back to the top of the Premier League with a 2-1 win at West Ham United to complete a Merseyside win-double over London clubs on Sunday. 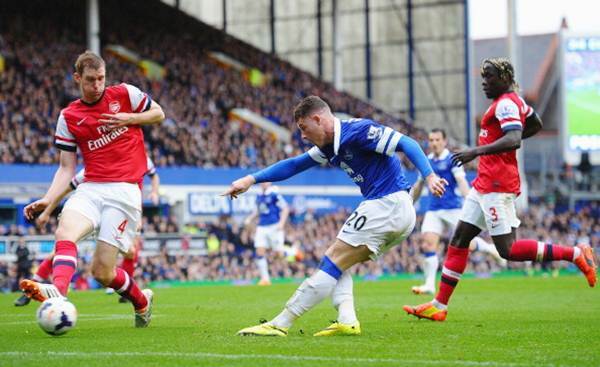 Earlier Everton crushed a woeful Arsenal side 3-0 at Goodison Park to boost their chances of a top four finish and a possible place in next season's Champions League for the first time in nine seasons. The two vitally important games had a big bearing on the top of the table with Liverpool top with 74 points from 33 matches, two ahead of Chelsea who have also played 33. Liverpool continued where Everton left off by chalking up their ninth successive league win after Gerrard put them ahead in the 44th minute with his first penalty after James Tomkins handled a Luis Suarez cross at close-range. West Ham equalised a minute later with a controversial goal from Guy Demel after former Liverpool striker Andy Carroll appeared to foul Liverpool keeper Simon Mignolet in the build-up. 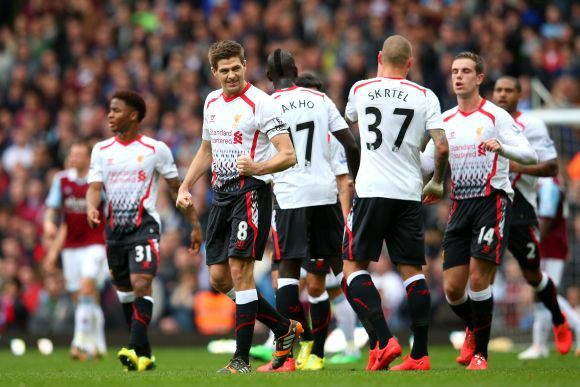 The ball dropped to Demel who swept it in. 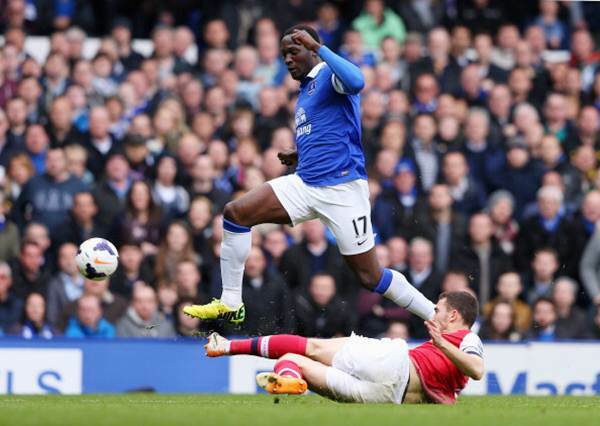 Everton crushed a woeful Arsenal side 3-0 at Goodison Park on Sunday to boost their chances of a top four finish and a possible place in next season's Champions League for the first time in nine seasons. 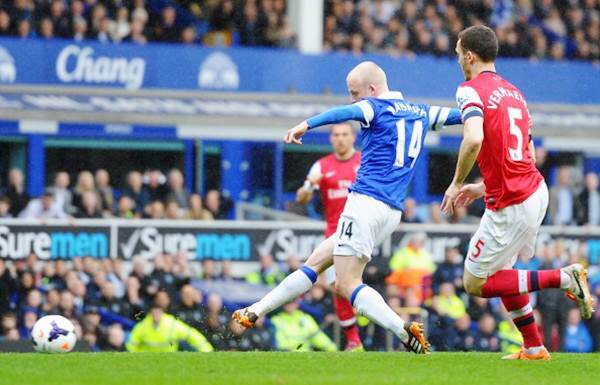 Goals from Steven Naismith after 14 minutes, a superb solo effort from Romelu Lukaku after 34 and a third after 62 when a Kevin Mirallas shot went in off Arsenal's former Everton midfielder Mikel Arteta for an own goal, sent Arsenal crashing to another heavy defeat on Merseyside two months after they lost 5-1 at Liverpool. Everton took part in the qualifiers in the 2005-06 season but were eliminated and have never played in the Champions League proper. On this form Arsenal will need a massive improvement in the closing weeks of the season to stop Everton finishing above them. They posed little to worry the Everton defence apart from a rasping late shot from Alex Oxlade-Chamberlain which Everton keeper Tim Howard tipped on to the bar, and their gloom was completed with Mathieu Flamini's 10th booking of the season ruling him out of next weekend's FA Cup semi-final against holders Wigan Athletic at Wembley.